Our friends, Cynthia and Alex Stone built a beautiful cabin after Cynthia completed her residence at Penland with me. They live in Florida, now, but come up when they can. Alex is an architect and Cynthia a jeweler. They have a daughter who is the same age as our Evelyn, so when they're up from Florida we all get together up at their wonderful cabin up on Ashland Mtn., a short drive from our house. 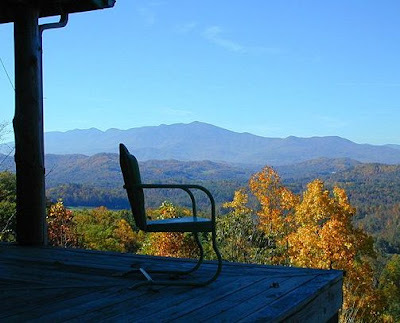 They have a web site with beautiful images of the cabin and from the porch looking out on the Black Mountains. They rent the cabin out to folks who want off campus housing at Penland as well as folks who want the retreat that it affords. They were kind enough to give us a listing in their links page and I thought I would give a shout out of thanks with a link to their site. Stacey and her gal pal's are having a get together up there this weekend and I'm always in awe when I see the view. Here is a slide show of the cabin and and the views, as well as the hawk from which they took the name!